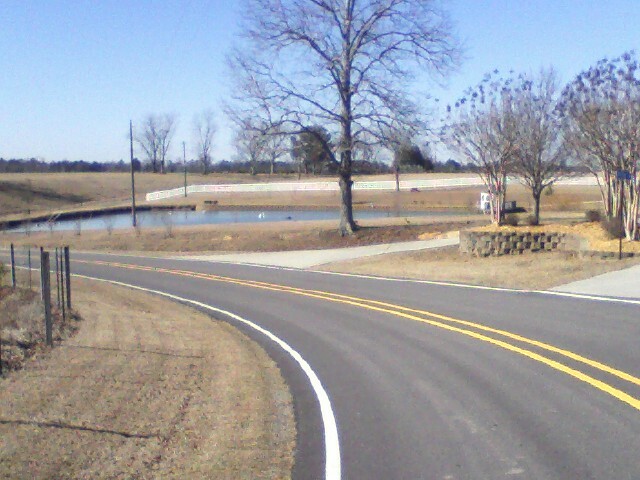 Well it seems Sunday, Jan. 30th, did not come with ideal racing conditions for many of us in the South. 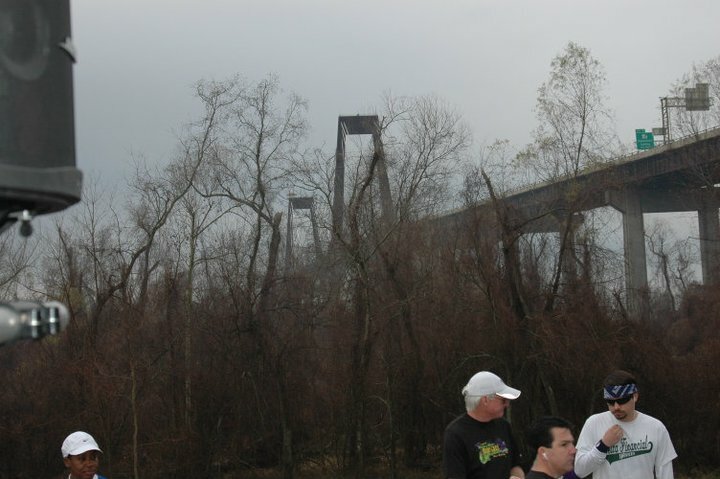 It was not ideal for the Houston Marathon, and it was not ideal for The Wall 30k in New Orleans. The temperature was ok (much colder would have been nice), but the humidity was out in typical Southern Style. My friend Wanda finishing the 10k. She will be running the Mardi Gras Marathon. 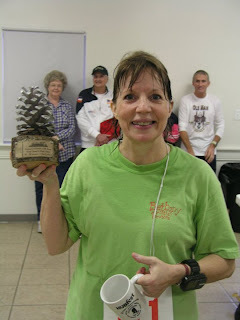 She is focused on a BQ race in Feb. Go Wanda! You may recall, I mentioned a few months ago, that I have given up my quest to race well when the humidity is high. This has been a GREAT thing for me to do. Now instead of heading to a race, unrealistically, thinking "I am superwoman, I can overcome." Now, I am attempting to adjust my prerace pace, to a more realistic goal for the weather of the day. This has been a GREAT thing for my racing. For years, I felt like it was giving up to do this, so stubbornly, I started races with unrealistic goals, only to go out too fast for the day, being disappointed over and over and over again. Also, by going out too fast, it made for a horrible race, most days. Go out too fast, suffer, suffer, suffer, struggle to finish, finish with a slow, really slow time. Now, I adjust my time 15 seconds per mile, if the humidity is strong. This allows me to hold an even pace for the whole race, I feel better, and I end up finishing the race with a better time than I would if I go out too fast, try to hold on, and end up falling WAY off the pace, the last half of the race. Early in the week, prior to the race, I was thinking I would attempt 8:30 pace for The Wall 30k (18.6 miles). As the weather predictions deteriorated through the week, Sat. night, I ended up deciding on 8:45 pace. Such a great thing for me to do. I ended up averaging 8:41. It was still hard to finish, but not nearly as bad as going out too fast and suffering through the rest of the race. It's also a great feeling to finish the day with a quality long run, sticking with the plan, instead being disappointed with the results (once again). What is it about humidity that makes you feel so "beat up" after a race. My recovery is totally different after racing in humid conditions. Even with the adjusted pace, as I finished the race and started walking, yikes, feeling rough. Finally, took an ice bath later in the evening and felt so much better. On the rare occasion that I race in COLD, low humidity conditions, I feel so much better, post race. Would love the science for dummies version of why this happens, please share if you know. Jen and I went to the race together. She has a great race report here. She took some pics along the way. I totally agree with her report, not a very scenic race, but a great way for me to get a quality long run in with other runners. Sun - 19 miles - .4 mile w/u, The Wall 30k (18.6 miles) - 2:42:10 unofficial. 8:41 avg pace. Happy with that, with the humidity of the day. 57 miles this week, .5 mile walk, 1 yoga class, 2 days weights. This week will be a "step-back week" for a little recovery time. *when the race conditions are BAD, I am adjusting my race goal, prior to the race. *getting 8-9 hours of sleep most nights. *taking a "step back" week after 3 weeks of increasing my mileage and intensity. 49 - can you live with it? "Oh What A Beautiful Day To Run!" Sat. was like a marathon. I went to a 5 mile race, raced it hard, and then Sat. evening, I ran 14 miles on rolling hills. Sat. evening I was adding up my miles for the week and I come up with 49 miles. In my world, most of the time, that just doesn't work for me. So today, I headed out for a 1+ mile walk and yes, I ran a mile to make it an even 50 miles for the week. I feel better! Can you end a week with 49 miles? Back to Sat. I raced a 5 miles race. Race temp. would be around 27 degrees, so that means a great race day for me. It's rough to get warmed up, but after the first 1-2 miles, this is when I am able to run my absolute best. I can breathe better, and my legs feel totally different. As I started my warm up, right from the start, I knew it would be a great day for racing. I have been running and racing since....well a LONG time, but this was only my 2nd, 5 mile race. My first 5 mile race was last Aug., 2010. 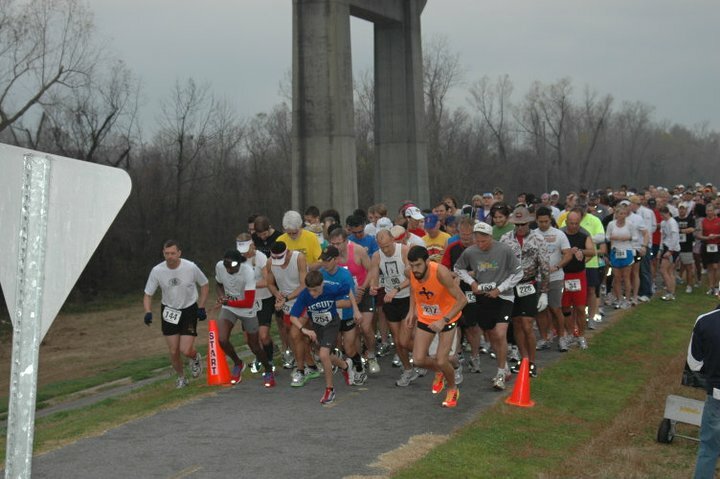 You may recall, this was a 5 mile race in South MS, and yes, I said Aug. So my pace for the race in Aug. was just under my marathon pace. Seriously! (42:58 - 8:38 pace) The name of the race on Sat. was Oh, What A Beautiful Day to Run, and it was just that. I finished with a time of 38:57 - 7:45 pace. After the race, I rushed off to a yoga class. Lunch, errands, and home around 2:00 pm. Here's the crazy thing. I do NOT recommend this, but I decided I would run my long run Sat. evening, after the race. I wanted to do this, to run with tired legs, and possibly simulate miles 18-26 of a marathon. Obviously, in doing this after racing, I was at risk of injury, so I do not recommend it, but I went into it accepting the risk. I needed to be out the door by 3:00 pm so I could finish before dark. So without any rest, I headed back out the door. I was tired, and it was hard from the start. The plan was to run it around 10:00 pace. The weird thing was, while it was hard, I had to keep slowing my pace. I would look at the Garmin, and be at 9:30 pace, slow down. I didn't want to run anything faster than 10, after racing. The other part of me wanted to hurry and finish, so it was a constant battle. Originally, I had planned to do 16, but while running, I found that 14 would be enough, also 14 miles would give me 21.5 for the day, which was a jump (another risky move) in my training. The gels kept me going, and I ended up finishing the 14 @ 10:14 pace. As I was struggling to make it home, the last 2 miles (like always) were tough. But then my running buddies, Eminem, Dr. Dre, and Soulja Boy helped me through. With one mile left, Diddy with Skylar Grey - Coming Home was up next on my Ipod. AAWWWEESOME! And just like that, excitement returned to my running. I made it home. I took and ice bath, had some green tea, and had, well let's just say, I had PLENTY of recovery calories. eeek! I was HUNGRY with a capital H! 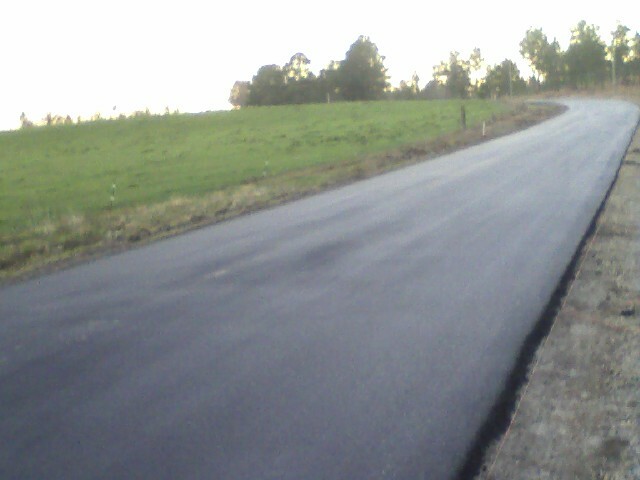 2 miles from home - new pavement and Diddy on the Ipod - I CAN DO IT! Love me some new pavement to run on! Me, with my friend Dawn before the race. Another Beautiful Day to Run! 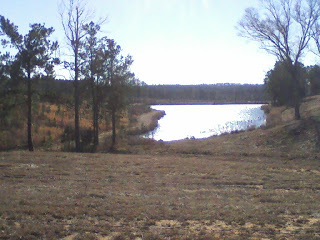 Wed. - 3 miles am, 4.5 miles pm - 2 mile w/u, 4 X Bent Creek hill with Audrey - (run cut short because Audrey wasn't feeling good) we walked a mile back to the car. Several times recently, I have said, "I don't recommend this! ", about my training. For many years, I have been considered by some, to be a "smart runner." It seems since running Boston, and getting that "out of my system" I am willing to "risk injury", to "push the envelope." In the MANY years of "running for Boston", I was very cautious, trying to be sure to avoid injury, and keep moving forward. Now it seems that I want to "push the limits" to see what happens. I do this fully KNOWING and ACCEPTING the risk. I wanted to note this on my blog to say, I know many of the things I'm doing are NOT smart, but at this time, this is what I want to do with my training. So these days, do not read this blog to see how to train smart. I wanted to check in with a little update about my week and return to running. I waited until Tues. to hit the roads again. I'm really happy and feel very fortunate that I only missed 4 days of running. Each of the days I missed my run, I ended up walking slowly for 30 minutes. I was pleasantly surprised with the quick recovery. The way I felt last Friday, I thought I would miss a minimum, of a week of running. Thurs - unplanned tempo run. As I was heading down the first hill of the 5 mile loop, heading to the 1 mile mark, I felt really good, and decided to run a 3 mile tempo run. I am happy to report I ran 3 miles @ 8:11 pace on hills. The 5 miles was at 8:23 avg. pace. Sat. - 14.5 miles on rolling hills 9:11 avg pace (stopped the Garmin for H20 stops) This was my first longish run since Jan. 3rd, which was 10 miles, REALLY slow, so I was a tad bit nervous. At the end of the day, I was HAPPY! Today I tried a Roctane for the first time. Felt good the whole run so I'm assuming it was successful. More planks today. I end this week with 45 miles of running, 2 miles walking, 2 days lifting weights, and 2 days doing planks. Feeling good about the quick return, and now I think I can finally start some quality training for the Snickers Albany, GA marathon. 6 wks doesn't leave a lot of time, but I'm totally up for the challenge and will "do what I can do". This wk I will be running some hill repeats on Wed., a 5 mile race on Sat., and long on Sun. Hope to get around 50 miles this week. Yay! * dropped my Christmas lbs., but still need to drop a few more to reach my Snickers goal. today's "what I'm doing right"
*I drank some green tea. First thanks so much for the well wishes. I am happy to report that I continue to feel better. I haven't decided yet, but should be back to running in the next day or two. With the extended break, I can tell you that I am about to POP with excitement. If you have been reading for very long, you know that marathon training it what gets me super excited. If you are new to my blog, you will soon realize, when I am in the height of marathon training, life is spectacular. Don't get me wrong, life is always great, but really I am at my happiest when I'm in serious marathon training mode. Most of my friends who train for marathons typically get "burnt out" as they reach the end of their training. I never get there, and I am thankful for that. So today, I am thankful for my passion for running and racing. Today, I am especially MOST thankful for my health. I am thankful that I am rarely sick. I tell you, several times on Friday, I felt so sad for people who deal with chronic pain or illness. I am thankful, I am blessed with good health. This is not a spot to brag about me. It's NOT that at all. (if you know me, you know bragging is not within me, it's not who I am. I state this here, because most of you don't "really" know me, and in writing, people can interpret things VERY differently) It's called "what I'm doing right" because if the segment was called "what I'm doing wrong", the list would be so long, it would truly overwhelm my readers. In addition, that would not be inspiring or motivating to anyone. So, from time to time, I will list a few things that I feel good about. It may be something new I'm doing, it may be something I'm always doing, it may be something that I have done in the past, and that I have started doing again. I am starting this in hopes of inspiring others to do simple things to improve your health, your mind, your body, your emotion, your finances, your relationships, etc. Anything that I think is a good thing for my life, may one day appear in this segment. It may be one thing that I'm doing right that day, or some days it may be several things. Some days there will be none. Does that mean I haven't done anything right? No, but this will be a random segment, when I think of things that may inspire someone to do something right in their world. Many times I read things on blogs, fb, etc. and I am inspired to join in, so I'm hoping others will find something good and inspiring about some of the posts. I recently found her blog. 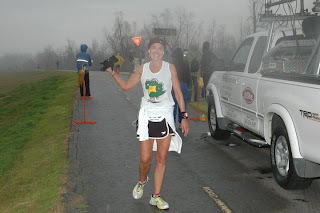 She is a MS girl and a runner, so I had to check her blog out. When I read her blog on Sat. It's just water...What's the big deal? immediately, I knew I had to join her, (thanks Laura - we can totally do this!) She inspired me to get back on track with my water consumption. I do fairly well, most of the time, but winter is a little challenging. It's hard because I'm VERY cold-natured (except for running - it's weird, I know). The thought of drinking 64 ounces of water, when I'm freezing, is just not always totally appealing, even though I know I need to. I drink it at room temp. but it still "chills me to the bone." The other part of her blog is about reducing soda consumption. I drink diet soda, and love it. I am not out of control, by any means. Some days I have none, some days I have two, but most days it's just one. I do crave a diet drink each day. My goal is to limit it to one per day, and maybe eventually reduce it from there. Baby steps! Have I mentioned I am a carb addict? I'm sure I have, somewhere along the way. I am totally buying into all of the recent reports that "diet" sugars keep us craving sugar. So I'm on a mission to reduce the addictive chemical as much as possible. I admire many of you who have eliminated all sodas from your diet. Maybe one day I will join you in the total elimination, but for now, I will be satisfied with moderation. * I also floss at least one time a day, but most days 2 times - if you haven't heard, flossing is SO important for your teeth, but it's much more important than that, it increases your overall health. According to realage.com, just by flossing daily, you can add 6.4 years onto your life. Totally worth the time and effort. ...and those are 2 good things for today! Please share with me, some of the things you are doing right today. This very moment, I should be in Mobile, AL visiting with my Mom and sister and anxiously awaiting the First Light half marathon. Instead, I'm at home and sick. I see on my counter that I have 55 days until the Snickers Albany, GA marathon and well.... basically, I have not started my training. What? Well, I did get in the 12k tempo last Sat. but other than that, no training yet. I'm NOT going to stress about it. I still have time, and I will "do what I can do." The good news is that I managed to get in 28 miles this wk before starting to get sick Thurs. evening. Friday, I felt AWFUL, like, in the bed, awful. Typically when I'm sick, I'm rarely "in the bed" sick. Friday afternoon was spent in the bed with the IPAD, the TV, and then the napping. I was surprised when I slept fairly well last night, and this morning (Sat.) I woke up feeling much better than yesterday. Still sick, but better. Should be back to running in the next few days and will not loose too much time, but hate to miss out on the half marathon on Sunday with my friends. Not having much luck with First Light in Mobile lately. Last year and this year, I preregistered and then couldn't make the race. Last year I was having a nagging hip thing going on, and this year sick. First Light holds a special place in my heart because that's where this fabulous marathon journey started. 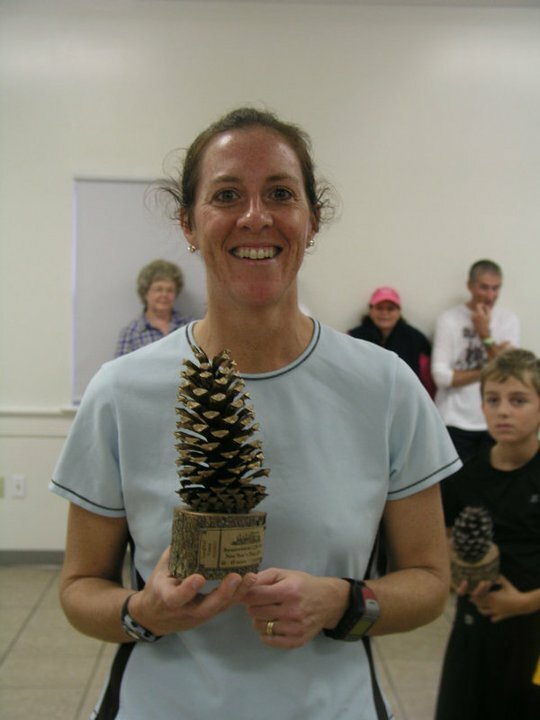 Dec. 2003 was my first marathon. I trained to walk it. I ran the first 4 miles, and then walked the rest. Back then, my goal was to complete one marathon so that I could say "I finished a marathon." The 12k and this wk! So I haven't totally come up with my BIG 2011 goals, etc. but I have made some progress. I started the year off "right" with the Steam Whistle 12k. As previously mentioned, this was not a PR attempt, it was about getting a good tempo run in, being with good friends, selling some DryMax socks after the race, and just having some fun, BUT most of all, about starting 2011 off "RIGHT." I really can't think of a better way to begin the year. Chad (hubby) helped with the race and it was great to have him there. This race was fun because Audrey and I had a plan to start the race together and to run an 8:15 pace, for a least half of the race. We both went into it not knowing what the day would bring. She was unsure because of her lack of training. She currently has a CRAZY busy life which is keeping her running to a minimum and she was sick on race day. I was unsure because, at that point, I was only 3 wks out from racing the Huntsville marathon, I took a short break from running and since returning to running, it's just been easy mileage. I was pleasantly surprised with the way I felt the entire race. At the half way point, we were right on pace. (8:14 avg.) This is an out and back race, and "the back" has a slight downhill to it. Yay, negative split. I ended up running 1:00:37 with an overall avg for the day at 8:07. Earlier in the week I had looked up my PR for this race and I was surprised that it was 7:42 pace. Yikes! I would struggle at run a 5k at that pace currently. This was actually a good thing, because knowing that a PR was totally out of the picture going into the race, allowed me to stay on track with the tempo run. During this race, I chatted more than ever before. I'm normally breathing so hard, that chatting is out of the question for me. I ended up winning my age group. 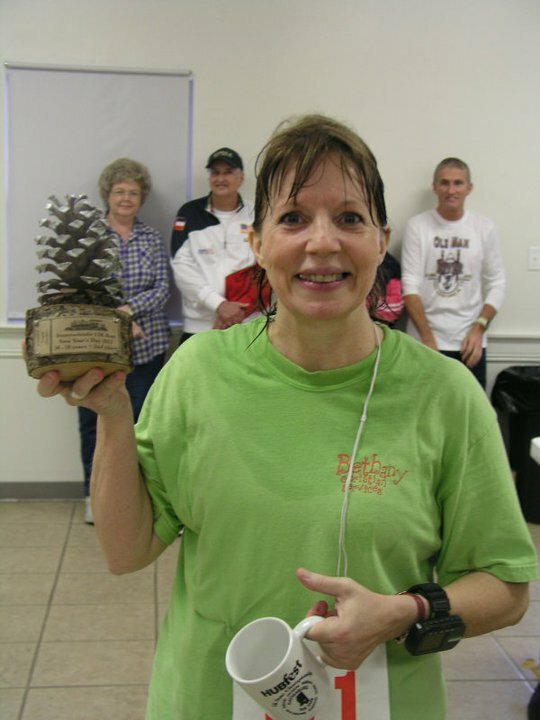 Donna made the awards for this race and she did an excellent job. Me post race and happy. Nestor and I go WAY back. Years ago, I noticed that I would see this guy at many races. I traveled to a race near Mobile, AL, The Turkey 10 miler, and there he was again. Knowing he was from MS, and had traveled to the race, I went up to him and talked to him. Since then we have been at MANY races together. 2 years ago he missed a BQ attempt in Pensacola by a few seconds. (Pensacola is NOT an easy course). For the past couple of years, Nestor has struggled to find his motivation for running. Nestor has been known in our area as "the fastest Columbian in South MS" We need to return him to that status soon. This is where you guys come in. I am hoping 2011 will mark Nestor's return to running and racing. Maybe you guys can give him a "shout out" filled with motivation, or maybe we need to "guilt trip" him into returning to running. It's just NOT the same when he's not running and racing around the south. This wk, I am upping my mileage. After the endorphin rush from the race on Sat. I started planning my wk. After feeling so good, I took that as a green light to REALLY start training. 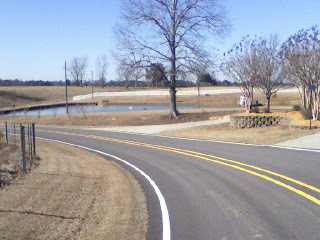 So I had planned hill repeats for Tues., increase in mileage, and run a half marathon this Sunday, Jan. 9th. I love to run and talk with people about running. I love the blogging world too. It amazes me how many times people say things that motivate me, or talk about something they may be doing in training that I want to try, or sometimes just a little "refocus." This happened this past Sun. I met a Steve and Dave to run a few recovery miles. Before the run, Steve was asking me about the race, and I was telling him how I ran well, but.... you know there's always a but.... blah, blah, blah...but my PR is 7:42 and I can't even run a 5k at that pace right now. Immediately, he says "NO, you are have not recovered from the marathon" BAM - back to reality. He is right, and in thinking about this more Sun. afternoon, and Monday, I decided to let the hill repeats wait for another day. Yes, I have very basically started my training for Snickers, but I still need to be really cautious. I read so many blogs about injuries, and I am trying to keep that from happening. So this week, I will have 1 quality run which will be the half marathon in Mobile, and I will not jump up in mileage as much as I want to. Monday - ran 10 of Robbie and Frank's first 18 miler. They're training for the Mardi Gras 26.2 in Feb. Their training is going well, and I look forward to their adventure in Feb.
Tues - went to yoga @ Spiers Fitness, for the first time in a few wks. Man, I needed that! Can't believe how quickly I can feel the difference when I miss my yoga classes. 1-2 times per wk is all I need to help. Obviously, I would benefit by doing much more, but I do what i can. After yoga, I ran 8 miles on rolling hills. Wed. - today - I went to The Yoga Room for another dose of yoga. Wow! I'm out of yoga shape! It will come back fast, I just need to get back to regular weekly classes. Later today I will get my running in. * I decided to join a local 100 day challenge. (Donna is in the challenge too) Each person's challenge can be individualized. The goal is to last the 100 days. I have participated for several years, but my goal has always been 30 min. of movement each day. This year, I will be starting the challenge with a running goal. The goal is to run each day for 100 days. BUT, I am going into this goal with "an out." If the goal to run 100 days, starts to have a negative impact on my running, I will go back to the 30 min. of movement each day for the 100 days. So, if I feel the 100 day challenge is making me dread running, or if I feel I really need a NON running day, I will take the day, and move forward. The goal of the challenge is NOT intended to have a negative effect, and I will NOT allow that to happen. *I want to drop a minimum of 7 lbs. 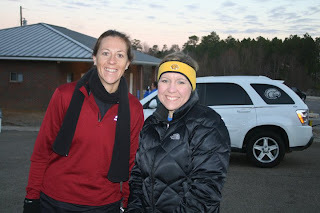 prior to the Snickers 26.2 mile run in March. There, I SAID IT OUT LOUD, and IN WRITING. Now it MUST be done! *would love to BQ again. The Snickers 26.2 course should be a BQ course, and I will try my BEST to make that happen. I do feel that it is a little soon after Huntsville, BUT, I am feeling good, and I feel like I have time to train, and train effectively, to run 3:50:59 so that is my goal for Snickers. The New Year's day 12K has been postponed until 12:00 today because of the weather so that gives me some time to think and blog this am. Yep, you guessed it, it's warm, humid and raining. It's race day! maybe with the delay, the cool weather will arrive just in time. A girl can hope and dream, right? Goals 2011 - I can't decide! Should I have mileage goals? Should I have PR goals? Should I have cross training goals? Should I have new training plans, & goals for that? Should I focus on learning to "race" on hills? Should I go for a running everyday for 100 days type of goal? Seriously, I can't decide and that is NOT a good thing. Part of my current indecisiveness comes in that I have basically already achieved my largest running goal of BQing, and running Boston. I have run PRs for several years in all race distances, and still strive for more, but I realize as my running/racing life ages, and my "age", ages, eventually, PRs will be behind me. Now, hold on just a minute. I am NOT ready to throw in the towel just yet. I still believe I can PR, but I am also a realist. With this "realization", I am searching for a new goals, something fresh and new. One idea, the obvious one, would be to "step- up" to ultras. This is the obvious path for most runners in my situation. Part of me says yes, but another part isn't totally up for that next step. Yes, I feel sure I will eventually run a 50k, but currently it's not a burning desire. I am searching for "the burn." Another avenue for many runners is the Triathlon avenue - me?....so far....NO, ZERO, nada desire. Never say never, but I will say, with the cost of that sport, I am hoping I never get that bug. My running shoes and marathon entry fees are enough for me. From 2005-2009 my life running goal was to "make it to Boston", period, that's it! I loved the journey, and pursued it with passion. So in 2010, I ran Boston. Leading up to Boston 2010, I wondered if I would still enjoy my running at all after finally achieving my goal. I am so HAPPY and RELIEVED to say yes, I STILL love it. I have also felt a sense of relief in, well...., in just the..... ahhhhh, I DID IT! I still have goals, but it's different. The goals are not as strong and apparent as the Boston goal was. I also have a whole list of marathons to run that will be challenging (hilly), but not PR opportunities for me. I have already signed up for Mt. Desert, Bar Harbor, ME for Oct. 2011, and this begins my "after BQ" list of marathons. So yes, I still have passion, yes, I still love to run, and yes, I still love to race, but I guess currently, I am searching for the next "burning goal". I'm searching for the next goal that I have a burning passion for. Hmm! *Achieved a new monthly high mielage of 253 miles in Oct.
*I know I CAN run a 5k PR, but I always get sidetracked with running/training for marathons. (I always multi-task with my training. I like the variety, but I also realize, I will never achieve my 100% total BEST with this multi-tasking approach to training. Maybe one day, I will commit to 100%, 5k training (maybe a goal) but I LOVE training and running marathons. *I ran a PR in the half marathon this year. * yoga continues to be a VERY important part of my training. I think it helps with injury prevention. *well - I ran my worst 5k in 5 years, but.... it did motivate me, fo sure! *It really stinks that the 5k PR weather, and the marathon weather happen at the same time each year. It's a short window of opportunity in the South, and that just stinks! *It stinks that I run so much better in dry and cold weather, but I live in South MS, and it's mostly warm and humid. *I have given up on learning to "race well" in humidity... and that stinks! 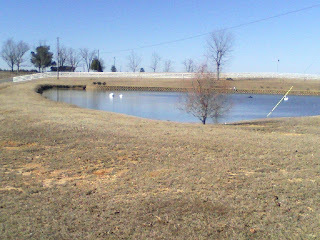 2011 - what I'm looking forward to. Today, the 12k - it will be a great tempo run. Audrey and I plan to run the first few miles together, so that will be fun. Next wk - I will run the First Light half marathon in Mobile, AL. Mardi Gras - half marathon in New Orleans. 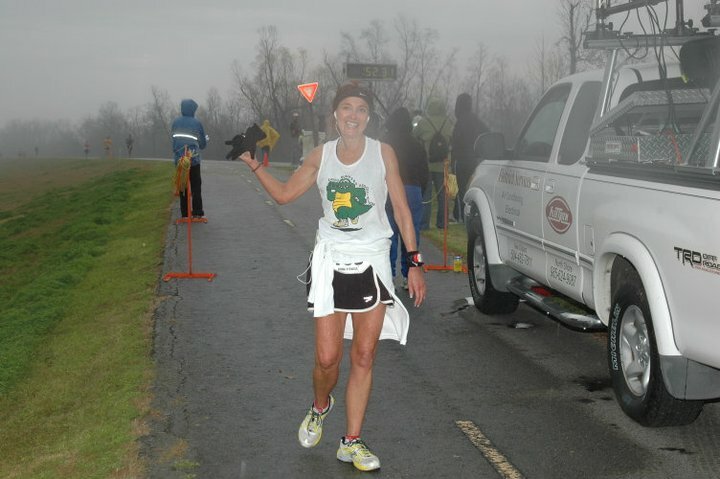 Snickers - full marathon in Albany, GA in March. shortened marathon training plan, but looking forward to this one. Flat and fast - my kind of race. Oct. - Mt. Desert marathon and meeting Bethany and Ryan who will be newlyweds. So, as I continue to think about my 2011 goals, I look forward to reading and hearing about your goals, and if you have any ideas for me, please share your thoughts.